November is a significant time of recognition for tribes throughout the United States; it encompasses National American Indian Heritage Month, as well as Native American Heritage Day on the Friday after Thanksgiving and, of course, Veteran’s Day. Partnership With Native Americans (PWNA) is marking these important dates with some recognition of our own, including a spotlight on Native students and education through our Heritage Month campaign, and today sharing this story on a Native American student who is also a veteran and a scholarship recipient through PWNA’s American Indian Education Fund (AIEF) program. Lawrence Wright, Jr., a Native American from Ohkay Owingeh Pueblo and U.S. Marine Corps veteran, 3rd Battalion 7th Marine Regiment (3/7), Weapons Platoon, Lima Company, enlisted, served 3 tours in Iraq and earned a Purple Heart, all before attending college. Lawrence began his 1st tour in Karbala in 2002. He returned stateside in 2003 only to begin training for a 2004 deployment in hostile zone Husaybah near the Iraqi and Syrian border. There, his unit sustained many casualties and Lawrence sustained shrapnel and explosions from enemy mortar fire. Evacuated by MEDEVAC for 6 months of rehab, a piece of shrapnel remains embedded in his shoulder. Lawrence’s 3rd tour of duty began in Ar Ramadi, where he faced two close calls with IEDs and was shot at by sniper fire. In September 2004, Lawrence was awarded the Purple Heart, and continued serving until 2006 as Lance Corporal. Once home in the U.S., Lawrence continued to support public safety. He completed the Indian Police Academy, FLETC (Federal Law Enforcement Training Center), and then graduated from the University of Phoenix with a Bachelor’s in Criminal Justice. 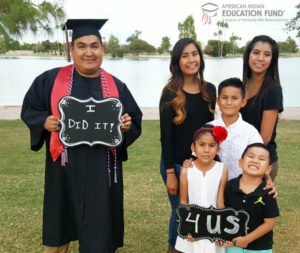 To support counter-terrorism, Lawrence is now pursuing a Master’s in Emergency Management and Homeland Security at Arizona State University. PWNA thanks Lawrence Wright, Jr., Native American veterans, and all veterans everywhere for their service and sacrifice for this land and country. For those of you participating in the Combined Federal Campaign, look for Lawrence and our AIEF video under CFC charity code 54766. This entry was posted in Humanitarian and tagged AIEF, American Indian, American Indian Education Fund, education, Heritage Month, Native American, Veteran's Day, veterans. Bookmark the permalink. Trackbacks are closed, but you can post a comment.